It’s always a good idea to get the head seated before actually tuning the drum up. By seating the head you are actually breaking the glue away from the hoop, allowing the head to be stretched. The easiest way to get the head seated is by placing the head on the drum, and making sure that the head is tight, and has equal tension across all lugs. You will be looking for a tone that is tight and high pitched. Place the drum on a padded surface, or carpeted floor with the head you are working on facing up. Take the palm of your hand and press down in the center of the drum as shown in image 1. If you prefer to place both hands together and use both palms this works also, just be sure that you do not apply too much pressure to the head (figure 1). If you find that you are pushing yourself off of the floor you are using too much force. You will hear the glue seal breaking, and cracking as you’re pressing on the head, don’t worry this is normal. After you have the head properly seated, you can let the fun begin! With the drum still on the padded surface or carpeted floor, go around each lug and re-finger tighten any loose tension rods. (figure 2) After this is completed pick the lug nearest you and tighten with your drum key 1/2 to 3/4 turn (figure 3) using the tuning pattern we have included and continue until all lugs have been tightened. It’s a good idea to tap the edge of the drum with your finger by the lug you are tuning, so you can hear the pitch and sound. You want to keep doing this until you have a tone by each lug without having a fluttering or buzzing sound. Once you have a tone that is resonant or ringing, you should then fine-tune the drum. Tap your finger again on the edge of the drum and listen. If the note seems high to you slightly loosen the tension rod (figure 4). Once you find the sound that you like, you want to do the same thing on all of the lugs until you have that same note at all lugs. This means that you have equal tension across the head. Here are a few pointers in regards to the tension between the top and bottom head. 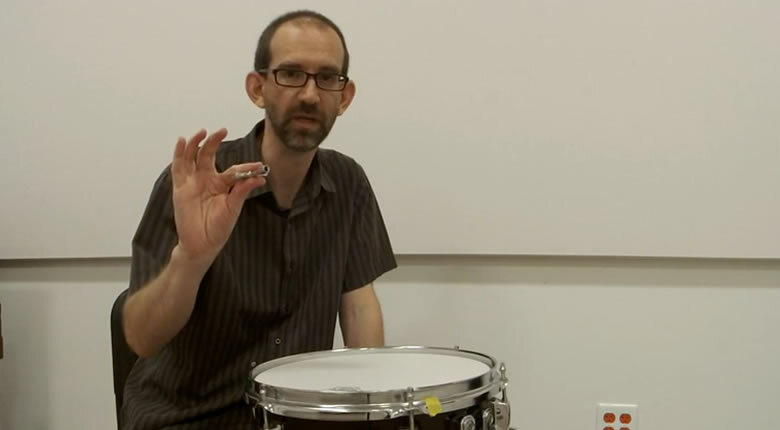 If the top and bottom heads are the same tension, the drum will have increased sustain or resonance. If the bottom head is lower than the top the drum will have less sustain. If the bottom head is tighter than the top the drum will have more sustain and resonance. Remember, there are really no rules to tuning. It’s strictly a matter of personal taste, and the sound that YOU want to hear. Tuning drums for the first time can be a bit frustrating, but once you do it a few times you will be able to do it in your sleep. Percussion Performance: Where the rubber meets the road!